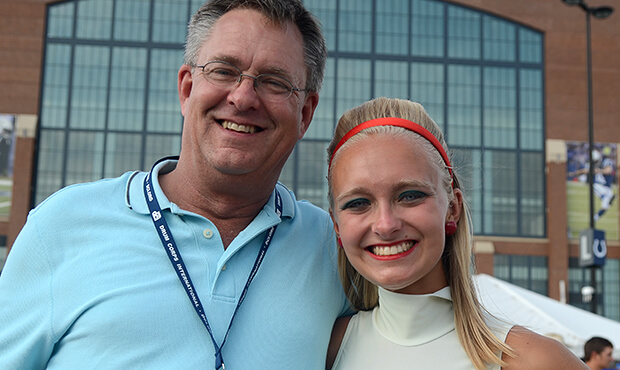 Greg Orwoll with daughter Kristen at the 2013 DCI World Championships in Indianapolis. This past November, longtime Colts Executive Director Greg Orwoll stepped down from his position after more than 30 years on the job. On Friday he will be recognized for his many years of service with the Colts, as the recipient of the 34th annual Dubuque County Fine Arts Society's Elisha Darlin Arts Award, which honors an individual or group that has made an outstanding contribution to the arts. DCI.org talked with Orwoll just days before he'll receive the award, discussing a range of topics from his latest work to provide a valuable service to seniors in his community, to his fondest memories with the Colts and watching his daughter perform in her last summer with the organization, to life in general after drum corps. DCI.org: Congratulations on the award you'll be receiving this week. How does it feel to be recognized like this? Greg Orwoll: This award recognizes the contribution both the Colts and I have made to the entire Dubuque community over the years. It's flattering to receive this honor, and it's particularly meaningful to have the work recognized that we've done over several decades to contribute to the arts community here. There were times over the years where we weren't always respected as a significant arts organization. Through a combination of improving the credibility of our programs, creating new programs for local members and staying invested in our community, we came to be thought of as one of the premier arts organizations in Dubuque. DCI.org: You spent more than three decades working with the Colts. What are some of your fondest memories of that experience? G.O. : I have so many wonderful memories. From the early days of my involvement working with then corps director Jim Mason on the Colts visual staff, through the years of being responsible for the program's success—and frankly survival—while trying to figure things out, and on through the growth and success we had, I think first of the many amazing people, members and adults, with whom I have created memories. The most profound experiences I had personally were private things—a personal breakthrough, a revelation, that "aha!" moment I helped create that inspired someone to soar. And sometimes those fond memories came from something that I made happen—usually behind the scenes—that I took great pride in. I always told myself that if people were noticing me, I was not doing my job. My favorite coffee cup on tour had printed on it: "I'm the executive. It's my job to keep exciting things from happening." DCI.org: Is there any one year or Colts production that you remember most? G.O. : There are a few shows over the years that really stand out for me, but interestingly enough, my personal favorite shows were not always the successful ones. When our audiences thanked us with long and loud standing ovations and our members were sobbing in reaction to a most intense personal success they had just experienced, that was it for me. Sometimes, shows we produced scored lots of points, but didn't seem to be as profoundly powerful experiences for our audiences or our members as some that didn't do as well. Were they as successful as some others? For me, no. We were the best 13th-place corps in history several times. No regrets. DCI.org: How did you feel after stepping down from your position with the Colts in the fall, and what has life been like since doing so? G.O. : I didn't realize how ready for a change I was—not only new things to learn and new challenges to conquer, but also personally. Running a drum corps is physically and emotionally one of the most challenging—and dare I say ... brutal—things one can do. Rarely is there enough of anything, whether it be time, money, facilities, support, energy or people; yet there is no excuse, no matter what, for not producing an amazing program for amazing kids. I am looking forward to the opportunity to become more involved in the Dubuque community. I just today attended my first meeting as a board member of Albrecht Acres, a summer camp for special needs kids and adults that I have always supported and admired. That was not possible before. DCI.org: Since leaving the Colts you've been named the executive director of DuRide, a nonprofit organization serving the Dubuque community. Tell us about the new position. G.O. : I'm the first full-time executive director of DuRide, an eight-year-old nonprofit organization that was looking for an experienced executive to lead it into the future. We recruit volunteers to provide rides for seniors 65 and older who can no longer drive themselves. Since I joined DuRide in November, I think our visibility is better and we are growing our numbers of volunteers and members. We now serve 240 members and have 150 volunteers who use their own cars to provide these rides. We consolidate the ride requests, then match an available volunteer with a requested ride, and usually handle 40 to 60 rides a day. The need for a service like ours—where door-to-door service is available—is important. While we have a very good public bus service and taxi companies, many elderly folks cannot get to a bus stop, nor ride a long bus route, nor afford a taxi. Nearly 40 percent of our rides are to and from medical appointments, and members inform us that many of these appointments would not be possible without us. We provided more than 10,000 rides in 2013. My role is to scale the organization to provide even more service for more members in the future. DCI.org: Your daughter was an age-out member of Colts this past summer. What was the experience like having a child in the corps? G.O. : She is my only kid, although I also now have a 15-year-old stepdaughter, who so far is not interested in drum corps. Kristen was involved in dance from an early age and found color guard to be a natural transition. She marched in the Colt Cadets through 2007, and 2008 to 2013 in the Colts color guard. Watching her grow and develop as a leader and a performer was an amazing opportunity, and one that few dads get to experience in this way. I was careful to never pressure her to do "Dad's Colts thing," and that paid off in that it was her idea, each year, to do another one. It culminated for her last summer when she served as color guard captain and was voted most outstanding guard member by her peers. I recall standing with a fellow director watching her dance a solo role in a show and saying, "I guess $10,000 worth of ballet lessons didn't go to waste!" The biggest single thing about Kristen in the Colts was the immense pride I felt about her and the satisfaction I took away from seeing her excel in something I helped create for her and all the other members. DCI.org: Are you still involved with the Colts organization today? G.O. : At the current time I'm involved from a distance, while I give the new administration space to establish themselves. Hopefully they will continue to seek my advice when things get interesting, so the level of excellence we established can be maintained while they find their own way. Profound wisdom was uttered when someone said, "You must know the rules before you are allowed to break them." There is a process in place that has ensured a successful transition, and the folks who have stepped up have been on our staff for many years, so continuity was assured. I am really serving as an advocate in the community during this time, assuring donors, fans, supporters and alumni that the Colts continue to be in good hands. In a community the size of Dubuque, it is difficult to separate the organization from the person, so for years to come, I may well still be the face of the Colts, and I would be most proud of that.